WhiteSmoke Writer is the leading software for writing correction on the market. 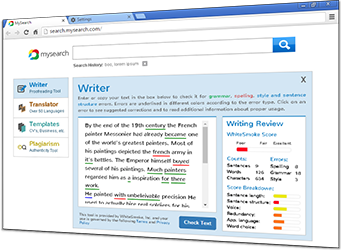 The core features of WhiteSmoke include advanced grammar, spelling, punctuation and style checking – all designed to detect and correct errors in your text. WhiteSmoke performs this error detection and correction by a combination of rule-based and statistical algorithms. These artificial intelligence algorithms, WhiteSmoke's artificial intelligence, enable the wide detection of errors in many different contexts. What’s more – it works everywhere you type: in MS-Word, in Outlook, or any other text-editing program or a web browser, you can use WhiteSmoke! Write concise and professional emails, memos, proposals and presentations. Edit your resume or CV and write impressive cover letters that will stand out to employers. Refine essays, research papers, thesis papers and other written assignments. 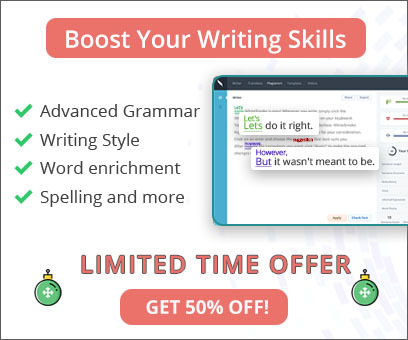 Elevate your writing to a new level, proofread editorial pieces and get creative whilst avoiding embarrassing mistakes on blogs, or other social media. Ensure accuracy in reports, product descriptions, legal contracts and other correspondences. Translate from your native language, learn from tutorials and write with confidence, regardless of your English background or skill level. WhiteSmoke Writer works everywhere you type! Simply highlight your text then press the F2 button on your keyboard and voilà! WhiteSmoke will show errors and offer corrections and ways to improve your text. It also automatically checks emails sent from Outlook and alerts you if any errors are detected, so you avoid embarrassing mistakes. The program is also available as an online version, “WhiteSmoke Anywhere”, that can be accessed from your web browser. This way you can use the editor on-the-go or on computers where you don’t have permission to install programs.